Traumatic dental injury (TDI) is a serious community health threat due to the increased incidence of road traffic accidents, violence, and increased participation of children in sports in recent years. It is anticipated that TDIs would probably outpace dental caries and periodontal disease as the most significant risk to oral health in the near future. TDI leading to avulsion (exarticulation) is complete displacement of a tooth from its alveolus and represents a complex and dramatic injury that may affect multiple tissues. TDIs are complex in nature which affect enamel, dentin, pulp, periodontium, alveolar bone, and cementum. Kostopoulou and Duggal, Andersson, Govindarajan et al., and Ankola et al. have reported the prevalence of TDIs leading to avulsion ranging from 1% to 16%.,,, Ankola et al. found that boys were three times more at risk for TDIs than girls. A number of factors determine the success of reimplantation of avulsed tooth such as extra-alveolar time period, choice of storage media, and contamination of the avulsed tooth which sequentially is related to the knowledge of dentist to an extent. The dentist's knowledge regarding TDIs leading to avulsion is critical for the prognosis of traumatized teeth. Management of traumatic injuries leading to avulsion may be a challenge to the general dental practitioners (GDPs), as it occurs when the dentists are least prepared. Thus, a prompt and standard management of TDIs can improve the case prognosis as well as reduce stress and anxiety in patients, their parents, and the dentist concerned. There is an exponential growth in Indian dental care services with an increase in the number of dental graduates and postgraduates passing every year. Literature search exhibited scarcity of evidence assessing the knowledge of GDP on TDIs leading to avulsion across the world and even more in India. Hence, this study was conducted with an aim to explore the knowledge of GDPs in Vadodara city about the emergency management of TDI leading to avulsion in a child. A cross-sectional questionnaire survey was conducted in Vadodara city to assess GDP's knowledge regarding emergency management of TDI leading to avulsion. Ethical approval was obtained from Institutional Review Board and University Ethics Committee (SVIEC/ON/Dent/RP/1509).The study lasted for a period of 2 months which started in July 2014. All GDPs of private and governmental hospitals, clinics, polyclinics of Vadodara city, registered in Indian Dental Association (IDA), Vadodara branch, Gujarat, constituted the sampling frame. The list of 278 registered GDPs comprising their clinic address, telephone number, and E-mail were obtained from local IDA branch in the city. Total enumeration method was followed for collection of data. All the GDPs consenting to participate were included. Dental Practitioners specialized in pediatric dentistry and those who could not be contacted before visit were excluded from the study. Prior appointment was obtained from the GDPs either by phone or through E-mails and schedule for the study was drafted. After the dentists' consented to participate, one of the investigators met them personally and asked them to fill the questionnaire. Total of 224 GDPs willing to participate in the study and who fulfilled the selection criteria were included. A 14-item close-ended self-administered questionnaire was prepared that included questions relating to demographic information and emergency management of TDIs resulting in avulsion. No personal information was sought from the dentists like the name or registration number. The questionnaire was pretested on 15 pediatric dental specialists for content validity. A total of 221 completely filled questionnaires were analyzed. Three incompletely filled questionnaires were excluded from analysis. Statistical analysis (Chi-square test) was done using SPSS version 18.0. (SPSS Inc., IBM, Chicago) The confidence interval was set at 95%. Total of 221 (79.5%) out of 278 GDPs consented to participate. Completed questionnaires with the data that were suitable for statistical analysis were included in the study (104 [47%] males and 117 [53%] females). A high response rate of 79.5% was observed in the survey (221 out of 278). 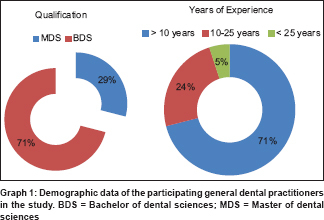 There were 156 (70.6%) graduates (BDS), and 65 (29.4%) of them had postgraduates degree in different branches of dentistry (MDS) except pedodontics and preventive dentistry [Graph 1]. Observations of the survey revealed that certain GDPs had undergone special training and experience of dental avulsion management in practice [Table 1]. The percentage distribution of the responses to the questions regarding emergency management of TDIs leading to avulsion is summarized in [Table 2]. There was significant difference in the level of knowledge observed when stratified by educational qualification with respect to management of TDIs leading to avulsion. Strategic factors of management in relation to inquiry on tetanus vaccine status, avulsed primary tooth management with respect to need for reimplantation, avulsed permanent tooth management with respect to need for reimplantation, tooth holding position for reimplantation and ideal storage media, need for splinting, and medication revealed statistically significant differences. The postgraduates/specialists had significantly better knowledge than the practising dental graduates. When comparing by the duration of experience, those with higher years of experience had better overall knowledge though significant differences were observed only for need of splint and need for tetanus vaccine posttrauma. Dental trauma is injury to the mouth, including teeth, lips, gums, tongue, and jawbones. Traumatic dental injury may include knocked-out teeth (dental avulsion), cracked or craze (fractured), displaced teeth (dental luxation, lateral displacement, or extrusion), pushed up into the jawbone (dental intrusion), or loosened teeth (subluxation or dental concussion). TDIs leading to avulsion can be defined as complete displacement of tooth out of socket. Among all the types of TDIs, avulsion is the most complicated, and hence, we decided to check the knowledge of management of avulsion among the dentists. Hu et al., Westphalen et al., and Kostopoulou and Duggal conducted studies on knowledge regarding dental avulsion in Sao Paulo, city of Curitiba, West/North Yorkshire and Humberside, UK, respectively, on GDPs; they observed that GDPs had inadequate knowledge in its management.,, The literature till 2016 warranted the need to improve the level of knowledge of GDPs in the management of avulsed teeth. However, the area of improvement of knowledge differed from one study to another [Table 3]. Probable cause for such an observation could be attributed to the type of professional training acquired by the GDPs in their respective areas.,,,,,,,,,,,, Literature search on the evaluation of knowledge regarding emergency management of avulsed TDIs in children among GDPs in India revealed no evidence. Hence, an attempt was made to discern the level of knowledge regarding emergency management of avulsed TDIs in children among GDPs. When the training for first aid management of avulsed tooth among GDPs was analyzed, majority of the GDPs had not undergone any training [Table 1]. Probable cause of such an observation could be attributed to the level of awareness in terms of first aid care provided for the GDPs in their professional training. The GDPs were also analyzed for experience in the management of avulsed teeth in their practice. It was observed that majority of the GDPs had not encountered such a clinical situation. This observation could probably be explained by the fact that such case would have been reported to the child specialists/pediatrician first for the general management of the injured child. The preference of systemic administration of tetanus was also evaluated. Majority of the GDPs preferred giving tetanus vaccine [Table 2]. However, the postgraduate GDPs gave higher preference in comparison to graduate GDPs. The observations of the present study were in accordance to the guidelines prescribed by International Association of Dental Traumatology (IADT). Majority of GDPs recommended holding of tooth by crown during the reimplantation procedure (78.3%). This observation of handling the tooth was in accordance with IADT guidelines and Ram and Cohenca. Poi et al. advocated that the solutions specifically prepared for the purpose of storing the avulsed teeth provided the advantage of maintaining the vitality, and the well-known solutions for such purpose were HBSS and Viaspam. About 33.9% of GDPs in our study preferred HBSS as a storage media for storing the avulsed teeth. Specialist GDPs included in the study preferred HBSS as storage media more over the graduate GDPs [Table 2]. Probable cause for such an observation may be that majority of GDPs included in the study would prefer saline or milk as a storage media for the preservation of avulsed tooth and lack of easy availability of HBSS. Our observations were in correlation to the observations made by AlJazairy. The knowledge on duration of extraoral time before reimplantation was also analyzed among all the GDPs. About 56.8% GDPs suggested reimplantation as soon as possible, no longer than 30 min of avulsion of tooth. All GDPs irrespective of education and experience had the similar opinion of reimplantation time duration. Our observations were similar to the observations made by Trope. When the need of splinting was analyzed for the management of avulsed teeth, 86% of GDPs preferred splinting of teeth for the duration of 4 weeks. The observation of this study was in accordance with the observation of Westphalen et al. and IADT guidelines. However, Trope advocated the usage of physiologic splint for a shorter period of 7–10 days. Only 55.7% (123 GDPs) preferred flexible splint for reimplantation of avulsed teeth for 4 weeks. However, we could not find any literature that compared the prognosis of 2 and 4 week duration of splinting in relation to avulsed teeth. Almost all the GDPs included in the study, 94.1% favored prescribing antibiotic therapy after replantation. Both graduate and postgraduate GDPs preferred prescribing broad-spectrum antibiotics. Our observations were in correlation to the observations made by Andreasen. The American Association of Endodontists and the IADT have also recommended systemic antibiotics, such as penicillin V four times a day or doxycycline two times a day for 7 days, at doses depending on the patient's age and weight. Furthermore, experimental animal studies have also verified a reduction in root resorption with the use of systemic antibiotics following reimplantation of teeth.,,, There is no evidence on preferred antibiotic and dosage after replantation of avulsed teeth. Hence, further studies are recommended to determine the choice of drug for reimplantation of avulsed teeth. The present survey showed that few dentists, in general, had the knowledge regarding emergency management and quality treatment necessary to improve the prognosis of traumatized teeth. Hence, there is a compelling reason to emphasize the dentists' awareness regarding their important role in managing TDIs leading to avulsion. Lectures, seminars, continuing education courses, workshops, development, and use of a formal protocol of treatment for TDIs are some possible ways to attain this goal. One of the limitations of the study can possibly be the smaller sample size of the study. Second, the responses could have been analyzed by the speciality to check for any confounding effect that it might have. General public and parents awareness are also very important and should be undertaken taking the help of media. Within the limitations of this study, the GDP's knowledge regarding avulsion and its emergency management was found to be inadequate. Very little but significant number of respondents answered the questions correctly according to the current IADT guidelines. GDPs with higher qualification and experience revealed better knowledge. The situation warrants introspection on need and ways to keep a dental professional updated with emerging advancements and trends in practicing dentistry. Kostopoulou MN, Duggal MS. A study into dentists' knowledge of the treatment of traumatic injuries to young permanent incisors. Int J Paediatr Dent 2005;15:10-9. Andersson L. Epidemiology of traumatic dental injuries. J Endod 2013;39:S2-5. Govindarajan M, Reddy VN, Ramalingam K, Durai KS, Rao PA, Prabhu A. Prevalence of traumatic dental injuries to the anterior teeth among three to thirteen year old school children of Tamil Nadu. Contemp Clin Dent 2012;3:164-7. Ankola AV, Hebbal M, Sharma R, Nayak SS. Traumatic dental injuries in primary school children of south india – A report from district-wide oral health survey. Dent Traumatol 2013;29:134-8. Granville-Garcia AF, Ferreira JM, de Menezes VA, Cavalcanti SD, Leonel MT, Cavalcanti AL. Dental avulsion: experience, attitudes, and perception of dental practitioners of Caruaru, Pernambuco, Brazil. Rev Odontol Cienc 2009;24:244-8. Hu LW, Prisco CR, Bombana AC. Knowledge of Brazilian general dentists and endodontists about the emergency management of dento-alveolar trauma. Dent Traumatol 2006;22:113-7. Westphalen VP, Martins WD, Deonizio MD, da Silva Neto UX, da Cunha CB, Fariniuk LF, et al. Knowledge of general practitioners dentists about the emergency management of dental avulsion in Curitiba, Brazil. Dent Traumatol 2007;23:6-8. Yeng T, Parashos P. Dentists' management of dental injuries and dental trauma in Australia: A review. Dent Traumatol 2008;24:268-71. Jain H, Agarwal A. Current scenario and crisis facing dental college graduates in India. J Clin Diagn Res 2012;6:1-4. Andreasen JO, Andreasen FM, Andersson L, editors. Textbook and Color Atlas of Traumatic Injuries to the Teeth. Wiley-Blackwell: John Wiley & Sons; 2013. p. 383-425. Hamilton FA, Hill FJ, Holloway PJ. An investigation of dento-alveolar trauma and its treatment in an adolescent population. Part 2: Dentists' knowledge of management methods and their perceptions of barriers to providing care. Br Dent J 1997;182:129-33. Cohenca N, Forrest JL, Rotstein I. Knowledge of oral health professionals of treatment of avulsed teeth. Dent Traumatol 2006;22:296-301.
de Vasconcellos LG, Brentel AS, Vanderlei AD, de Vasconcellos LM, Valera MC, de Araújo MA, et al. Knowledge of general dentists in the current guidelines for emergency treatment of avulsed teeth and dental trauma prevention. Dent Traumatol 2009;25:578-83. Zadik Y, Marom Y, Levin L. Dental practitioners' knowledge and implementation of the 2007 International Association of Dental Traumatology guidelines for management of dental trauma. Dent Traumatol 2009;25:490-3. Cınar C, Atabek D, Alaçam A. Knowledge of dentists in the management of traumatic dental injuries in Ankara, Turkey. Oral Health Prev Dent 2013;11:23-30. Akhlaghi N, Nourbakhsh N, Khademi A, Karimi L. General dental practitioners' knowledge about the emergency management of dental trauma. Iran Endod J 2014;9:251-6. Re D, Augusti D, Paglia G, Augusti G, Cotti E. Treatment of traumatic dental injuries: Evaluation of knowledge among Italian dentists. Eur J Paediatr Dent 2014;15:23-8. Hatem M, Taher EM. Libyan general dentists' knowledge of dental trauma management. Int Dent Med J Adv Res 2015;1:1-6. Abdullah D, Soo SY, Kanagasingam S. Knowledge of managing avulsed tooth among general dental practitioners in Malaysia. Singapore Dent J 2016;37:21-6. Kinoshita S, Mitomi T, Taguchi Y, Noda T. Prognosis of replanted primary incisors after injuries. Endod Dent Traumatol 2000;16:175-83. Weiger R, Heuchert T. Management of an avulsed primary incisor. Endod Dent Traumatol 1999;15:138-43. Pefaur A. Reimplantation of a deciduous tooth after traumatic avulsion. Rev Fac Odontol Univ Chile 1988;6:20-4. Zamon EL, Kenny DJ. Replantation of avulsed primary incisors: A risk benefit assessment. J Can Dent Assoc 2001;67:386. Ram D, Cohenca N. Therapeutic protocols for avulsed permanent teeth: Review and clinical update. Pediatr Dent 2004;26:251-5. Poi WR, Sonoda CK, Martins CM, Melo ME, Pellizzer EP, de Mendonça MR, et al. Storage media for avulsed teeth: A literature review. Braz Dent J 2013;24:437-45. Trope M. Avulsion of permanent teeth: Theory to practice. Dent Traumatol 2011;27:281-94. American Association of Endodontists. Recommended Guidelines of the American Association of Endodontists for the Treatment of Traumatic Dental Injuries. Chicago, IL: AAE; 2004. Hammarström L, Blomlöf L, Feiglin B, Andersson L, Lindskog S. Replantation of teeth and antibiotic treatment. Endod Dent Traumatol 1986;2:51-7. Cvek M, Cleaton-Jones P, Austin J, Lownie J, Kling M, Fatti P, et al. Pulp revascularization in reimplanted immature monkey incisors – Predictability and the effect of antibiotic systemic prophylaxis. Endod Dent Traumatol 1990;6:157-69. Andersson L, Andreasen JO, Day P, Heithersay G, Trope M, DiAngelis AJ, et al. Guidelines for the management of traumatic dental injuries: 2. Avulsion of permanent teeth. Pediatr Dent 2016;38:369-76.